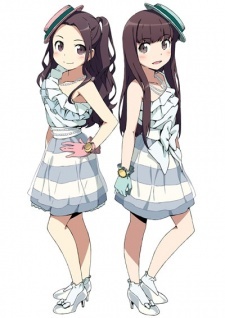 ClariS is a singing group consisting of two high school girls who gained popularity through the video sharing site Nico Nico Douga as “アリス☆クララ" ("Alice☆Clara") in 2009 and 2010. They have since changed their name to “ClariS” for their major debut in 2010, which means “sunny, clean and bright” in Latin. Since they are still high school students and want to focus on their school studies, they will not reveal their identities. Therefore, they will only be shown as illustrations. They both started their high school education in April 2012, according to their official Twitter. When drawn, Clara is depicted wearing pink items, and Alice is shown wearing blue items. Images of the crescent moon are used as a motif to represent Clara, and the sun is used to represent Alice, which comes from their personal preferences. Clara is shown with slightly wavy hair and no bangs, while Alice is drawn with straight hair with bangs. In 2014, Alice left ClariS to focus on her studies. Clara was then joined by her friend Karen whom she met when they were classmates at the same music school. When drawn, Karen is depicted wearing pastel green items, and images of stars are used to represent her.